A major focus of the Pork CRC is reducing the cost of production and making the industry more internationally competitive. The Pork CRC has invested in two FeedLogic feeding systems and a major study using the system is about to be completed at the Department of Agriculture and Food WA (DAFWA) Medina Research Centre in WA. Traditionally, pigs are fed three to four diets in the grower and finisher phase, but the pig’s requirements for nutrients are constantly changing as they grow. Currently the pigs are frequently fed a diet supplying excess nutrients, which means extra cost for no return. A new method of feeding, ‘blendfeeding’, where pigs are fed a combination of just two diets, may offer a more cost-effective alternative. Accurate blending ensures the growing pig’s nutrient requirements are met. The research, led by Karen Moore, Roland Nicholls and Bruce Mullan, all of DAFWA, fed pigs the traditional way or used the FeedLogic system to change their diet every week through blending. A third option was also evaluated, where pigs were fed a single diet from 20 to 105kg, the theory being that the diet is initially deficient, with the pigs displaying compensating growth when the diet is supplying excess nutrients after 60kg LW. The lysine to energy ratio of the three treatments is shown in the graph. 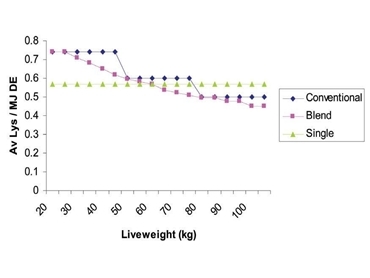 Preliminary results to 19 weeks of age suggest that compared to the conventional diet, both blendfeeding and feeding a single diet reduce feed costs by an average of $3.30 per pig, with no impact on growth performance. Further details, including full implications on carcase value, feed costs and changes in feed: gain over time will be available soon. The FeedLogic system can automatically deliver multiple diets to specific feeders and provide accurate information on feed disappearance, and will be an important resource for future studies with growerfinisher pigs.